The latest draws for British Columbia PNP took place on 13th and 20th September. Surprisingly they show a new low across multiple categories. The points needed by international graduates and eligible workers in order to receive an invitation for applying, in the provincial nomination are low. As much as 378 ITAs were issued during this period, which also included those issued under the Tech Pilot Program. This PNP is managed by Skills Immigration Registration System. In this, the eligible candidates are required to register an account. They receive a score which is based on the economic and human capital inputs. Starting from the highest-ranked, the eligible candidates are invited to apply. 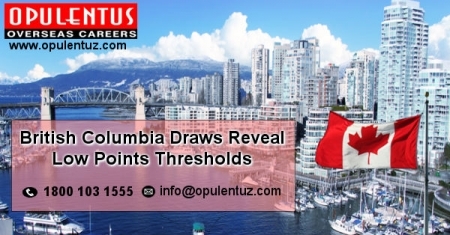 They also require that the applicants have a job offer from employers who are based in British Columbia. Some candidates who have been invited can now submit their PNP application (BC) through an enhanced sub-category which is presently in alignment with the Selection System of FEE. When the candidates are given a Certificate of Nomination, they are rewarded with the addition of 600 points, under the CRS, and an ITA in the future pool draws. The applications for PR for other skilled workers, and invitees, who are graduates, will be dealt not through the Express-Entry, after being nominated from BC. The candidates who are successful in meeting the eligibility criteria to apply for immigration, in a different category of the British Columbia PNP must enter in the SIRS pool. They receive a score calculated on the basis of education received, civil status, besides work experience gained. The top ranking candidates are given ITAs. The Express Entry, Skilled Worker visa, is aimed at skilled workers who possess post-secondary education, besides training/employment experience in a professional occupation. Applicants should be eligible to enter the Federal Express Entry pool, and they receive 600 points for success, which is a great boost to go forward. Graduates of a Canadian university/college, who have studied during the last two years, are eligible to apply in the Express Entry International Graduate category. It is open to graduates who studied at a university or college anywhere in Canada and is perfectly aligned with the Federal Express Entry System. It is designed for the worker having post-secondary education and is experienced as an employee working in a skilled occupation. A job offer is mandatory in this case. All the Ineligible candidates, who fail to qualify for other immigration programs, are eligible to seek this visa and apply for PR. They need to work in an occupation in the Sectors of hospitality, food processing tourism, or trucking. We, at OPULENTUS, facilitate skilled workers from all countries to move to rewarding careers and prove their worth in Canada. On the basis of an efficient Staff, we open the doors of Australia. You can freely contact us at [email protected] or call us 1800 103 1555. We will take care of all your concerns and troubles.